In what must surely be a disappointment and a shock for Jim Schellinger, a new WISH-TV Poll shows Jill Long Thomps on leading the field in Democrat efforts to unseat Daniels. According to the poll, 41 percent of Democratic primary voters polled indicated support for Long Thompson, 16 percent favored State Senator Richard Young, Jr. while 10 percent chose Indianapolis architect Jim Schellinger. In a match-up with Governor Mitch Daniels, the poll found that Long Thompson, who launched her campaign just 10 weeks ago, was within eight percentage points (Daniels 46, Long Thompson 38). Most alarming for Daniels is that only 39 percent of Hoosiers say that he deserves to be reelected. 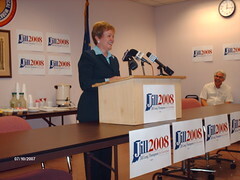 Jill Long Thompson represented Northeast Indiana in the U.S. House of Representatives serving from 1989 to 1995. She also served as Under Secretary of Agriculture for Rural Development from 1995 to 2001. Long Thompson most recently served as CEO of The National Center for Food and Agricultural Policy. She received her B.S. in Business from Valparaiso University, and her M.A. and Ph.D. in Business from Indiana University. Jill Long Thompson and her husband Don Thompson, a commercial airline pilot, live on a farm in Marshall County. Many bloggers over the past few months have denigrated Jill and her efforts to end the Daniels’ reign. Many comments have been made that she is a joke and she should step aside so that the primary won’t be a fight. Looks to me like the average Hoosier doesn’t agree with those bloggers. Although we have a long way to go, I would say that Jill is doing pretty darn well for starting her campaign just 10 weeks ago in July. The Schellinger crowd must also be shocked that, although their candidate has been out there since the first of this year, he still is in third place. I suspect Hoosiers don’t want another CEO-type like Daniels; they want a governor who understands Indiana, has experience in government, and has ideas that will benefit Indiana. Schellinger and Young are both good people, but those negavites out there who have been so quick to dismiss Jill might want to reconsider. If they truly want to see the strongest person challenge Daniels, then perhaps it is time to stop slamming Jill and recognize that she is the best choice to confront Daniels and his disastrous policies. This entry was posted in Democrats, Mitch Daniels, Politics, Republican Party by Charlotte A. Weybright. Bookmark the permalink. What is strange I think I am going to find myself voting for the very women I worked to get kicked out of office. Yes, I did vote for Daniels the first time around but the chances of doing so a second time is pretty darn slim. Strange how things work out at times. Then again, us middle of the road people are like that. We don’t push buttons based on the party but the person.